Home MTAANI NEWS Eng. Wainaina’s stern message to Chebukati, Maraga and NASA. Eng. Wainaina’s stern message to Chebukati, Maraga and NASA. Thika Town MP Eng. 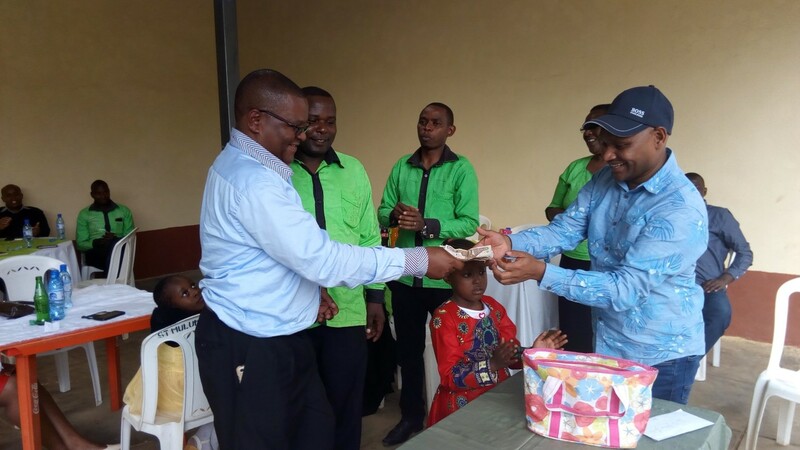 Patrick Wainaina receiving some donation from Thika KNUT Branch Chairman John Kuria in aid of St. Matia Mulumba Catholic Church choir, Makongeni on Sunday. Thika Town MP Eng. Patrick Wainaina Wa Jungle has called on all those heading public institutions not to drag themselves into the current political intrigues in the country but instead be in the forefront to ensure that the will of the people to reign supreme. While speaking at St. Matia Mulumba Catholic Church Makongeni, the legislator expressed his disappointment with the IEBC chair Wafula Chebukati for the way he was handling the crisis in his commission. Wainaina described the chairman’s memo to his CEO Ezra Chiloba as an instrument of politics pointing out that Chebukati was simply playing to the whims of NASA by subjecting a section of his juniors to the court of public opinion. “Instead of offering leadership, Chebukati is creating anxiety through the memo which in fact was not meant for Chiloba but to help NASA in their quest to show that the August 8 elections were bungled,” said Eng. Wainaina. He reminded the commissioners that the destiny of the more than 45 million Kenyans was in their hands and the people would not expect nothing short of a free and fair elections from his team. “All eyes are on you Chebukati and your team and we expect nothing but a free and fair election on the 17th (of October). Go put your house in order and execute your mandate as dictated by the Constitution of Kenya,” he added. The engineer also took a swipe on the decision of the Supreme Court which he described as insincere considering the fact that it did not reflect the will of the people of Kenya. He reckoned that justice was best served when guided by the common sense of the people and not special interests that made the noisiest commotion as sovereignty lied only with the people. “It is the people, not politicians, who should decide the country’s destiny. The people’s power should never be ceded to those we elect or institutions ran through taxpayers’ money. Democracy breaks down when the voice of the people doesn’t matter and their sovereignty is rigged in favour of some narrow interest,” said the Thika MP. He wondered what logic Justice David Kenani Maraga and his team of judges used when nullifying the presidential results on the account of a few clerical and technical errors. He argued that Justice Maraga should have instead verified the votes by ordering a recount. Wainaina wondered how the judiciary could be allowed to subvert the will of the people of Kenya by deciding their leaders for them. Wainaina dismissed as empty threats, warnings by NASA legislators that they would boycott Parliament when President Uhuru Kenyatta addresses a joint sitting of the bicameral House on Tuesday, terming the threats are misguided because there is no vacuum in the office of the President. He boasted that Jubilee Party and its affiliates had the numbers in both houses and that nothing would stop them from kick-starting the 12th House business. “NASA knows that Raila (Odinga) cannot win the presidential election and they are using all sorts of mischief to bring him to power through the backdoor. Threatening to skip Parliament or saying that they will not go to the elections on the 17th (of October) if certain demands are not met is defeatist and a ploy to force a ‘Nusu Mkate’ government which this time round will not work,” he said. He reminded them that Uhuru Kenyatta was still the president of Kenya as the Constitution allowed him to perform his duties until the next president is sworn in. “If they fail to participate in the elections, we shall swear in the president (Uhuru) on the 18th of next month as there is no provision in our constitution which says that there cannot be an election in Kenya if Raila’s name is not in the ballot,” he warned. He however urged all Kenyans to rally behind the president and get out and vote for him on the 17th so that this matter could be settled once and for all. He urged everyone to look for those people who failed to vote in August and convince them to, this time round, get out and vote for President Uhuru Kenyatta.